Bottom Line: A nice creamy, lighter-styled añejo sipper. 89 • Amatitlan Blanco Tequila 40% (Mexico) $15.00. 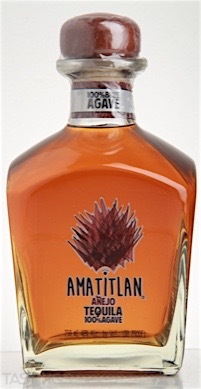 93 • Amatitlan Reposado Tequila 40% (Mexico) $17.00. 89 • Amatitlan Añejo Tequila 40% (Mexico) $19.50. 88 • Ardiente Pasion Silver Tequila 40% (Mexico) $7.00. 86 • Ardiente Pasion Gold Tequila 80% (Mexico) $7.00. 84 • Tres Pesos Silver Tequila 40% (Mexico) $6.95. 88 • Tres Pesos Gold Tequila 40% (Mexico) $6.95. Añejo ("old") Tequila is aged in wooden barrels (usually old Bourbon barrels) for a minimum of 12 months. The best-quality añejos are aged 18 months to three years Beyond three years they can be called extra añejo. 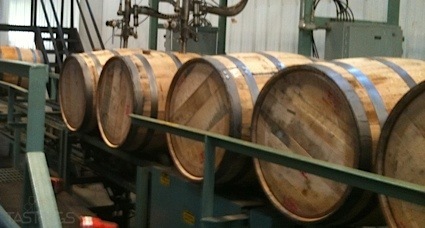 Aging takes place in barrels formerly used to mature bourbon and rarely Cognac. Those aged in the latter vessels have more of a mellow edge, with aromas ranging from vanilla to tobacco, while those aged in former bourbon barrels often have notes of dill and coconut from the American oak. Añejo tequilas should be sipped neat, after dinner in a copita or snifter and perhaps enjoyed with a cigar. Amatitlan Añejo Tequila rating was calculated by tastings.com to be 89 points out of 100 on 5/25/2016. Please note that MSRP may have changed since the date of our review.